At home my desk was the magical abode. 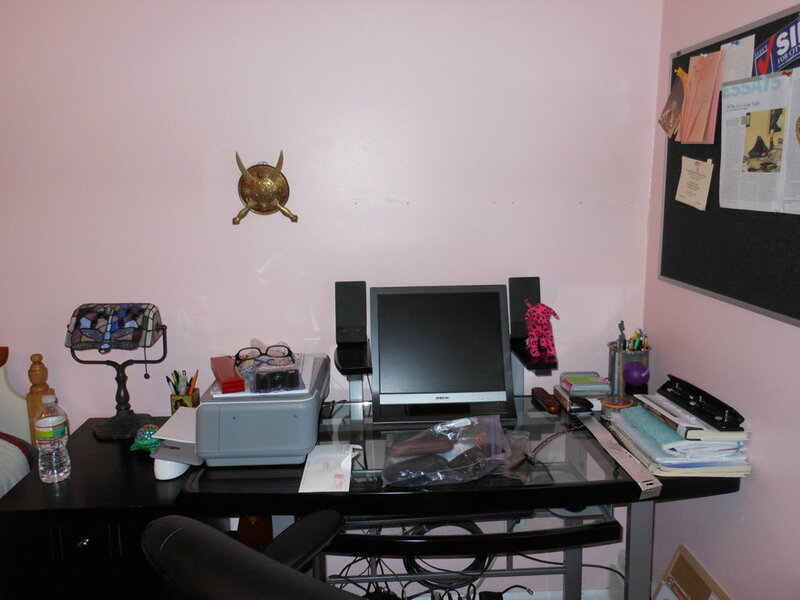 Inside my cotton-candy pink (actual color), painted room, I resided in my intellectual safe haven; Shutting the door behind me, tuning out everything else with my loud desktop speakers, joining Facebook for the first time, and getting to work on essays, projects, lab reports. The desk was my place of contemplation, thinking and discovery. The desk was where the magic happened. Once high school was over, the desk at home remained and with it, the magic also remained. However, it was a new kind of magic -bad magic. The desk is now the epicenter from which magical bad vibe waves emanate. The desktop computer runs at a speed that is 10X slower than my laptop. When you step into the wave area your reflex is to back away slowly, as your are still in denial about how you’re breaking up with the desk that brought you an accumulated decade’s worth of lauded writing and a college education, has changed. With college came the inevitable long-distance relationship status and nothing was ever the same. Thinking suddenly becomes a localized chore that the desk forces upon you. However, long-distance is not to blame. The dorm room desk wields the same onerous wave-power. Pattern: Desks that are in a permanent living space and near a bed = la magica no ocurre aqui. And so I keep moving. I move to a desk outside the permanency of a living space: the classroom or the library. The first week of classes has arrived and everyone knows that once you have sat down somewhere in the lecture hall or room, you remain there for the entire semester lest you covet death stares. I am one of those people who don’t mind the death stares. (Probably because my death stare is infinitely better than 99% of others- years of pessimism does that to you.) Sometimes I like to change it up. Maybe one day I missed the reading and want to sit towards the back or maybe one day I enjoyed an assignment so much that I want to be noticed for the work I put in and sit in the front. Maybe I just wanted to tick someone off - if good reason warrants it. I don’t act on emotions which may partially explain why dwelling in a middle ground has never been a specialty of mine. The worst desk shift, that even ticks me off, experienced death starer that I am, is during lecture. It is those groups of more than three people that must sit with each other at all costs each and every time the class meets. And so, when one of the groupies does move, effectively, an entire row has been shifted and the whole silently understood seating arrangement becomes equivalent to a rushed and messy eyesore of a game of Tetris. Still, the classroom seating arrangements are temporary. If you really want to change it up to your liking, you can do so the next day. (I suggest making it your priority to arrive a little earlier.) People may make snide comments in hushed tones and you could either ignore them or confront them, but either way, you do not have to undo what has been intentionally done because there is no written law, (assuming you’re in the U.S). Studying space, as in the library, is the real cause for concern. Studying lasts a much longer time than a class period does and you cannot change it up because anyone, classmate or not, can come at their own time and according to their own schedule. You do not know when other people will choose to arrive in your study area, and may potentially have access to your study desk, because they’re not all in the same class as you as they were in the prior context. Now someone is sitting in your spot. You decide to wait until it frees up despite the fact that you’re taking away from your allotted studying time. Walking is good. You can exercise in the meantime - take a short walk. He/she is still there or has inconsiderately left his/her possessions, all the while being blessed because nothing has been stolen, and doesn’t come back - or comes back after you have decided to leave. Maybe you don’t leave and attempt to find another desk. You cannot focus at this new and what seems to be an outcast desk, (since no one else was vying for it.) Time to leave. I have guarded my study spot pretty well over the past few years. The regulars kind of set everything in order, similar to the classroom scenario. Those awkward acquaintances got yo’ back after all. Conclusion: Thinking on your feet is no longer the acquired skill that comes with practice. It is no longer the fleeting and quick idea developed in less than thirty seconds. Thinking on your feet = Any thinking that will ever occur. No more desk in your room being the only place where your genius can emerge. or high rise apartment dorm room.